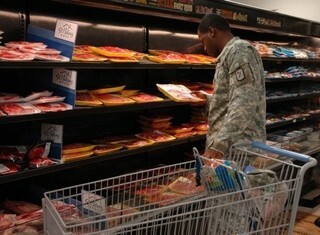 For user-friendly commissary discounts on all of the groceries and other items you need when shopping on McGuire Air Force Base, located near Wrightstown, New Jersey, just go to MyMilitarySavings.com. We understand that sifting through dozens of sites for coupons and other savings takes up a lot of time that military life doesn’t always allow for, which is why we’ve gathered together discounts from a variety of sources, making us your one-stop shop for savings and helpful shopping tips. That includes a convenient link to the Defense Commissary Agency (DeCA) website, where you can find a plethora of coupons that you can download directly onto your Rewards Card for instant savings at checkout. What’s more, you can visit our My Home Base page and set your location to McGuire Air Force Base for a handy landing page with specials, maps, and other helpful information for your local commissary. Plus, to further help you prepare for your next trip to the commissary, we’ll send you a weekly e-newsletter that includes links to digital copies of the latest Coupon Connexion and Price Connexion. To learn more about how we can help you save money when you shop at the McGuire AFB commissary, sign up for your free MyMilitarySavings.com account today.